Everyone knows what pool noodles are – they are a pool toy favorite for millions around the world. Most kids use them in the pool to float, play ‘fight’ against each other, or even to spray water at each other. 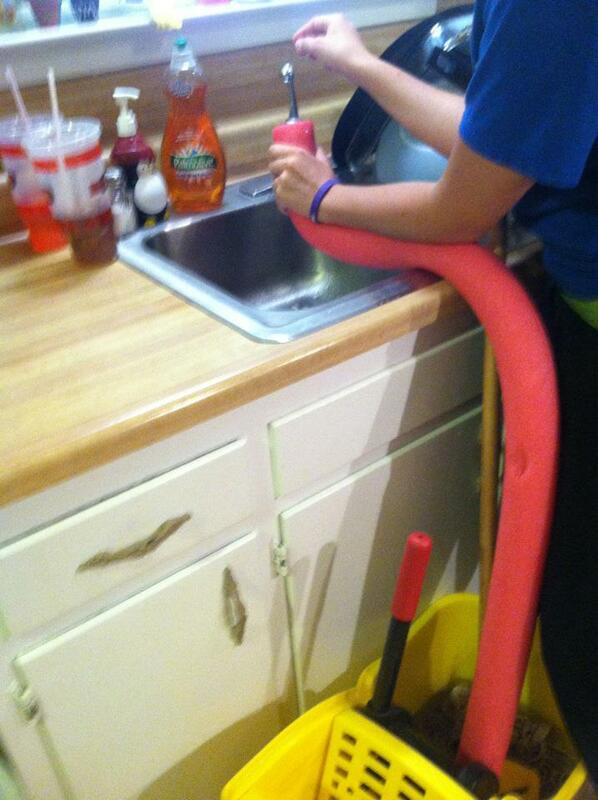 That being said, pool noodles aren’t just for your kids and the pool. 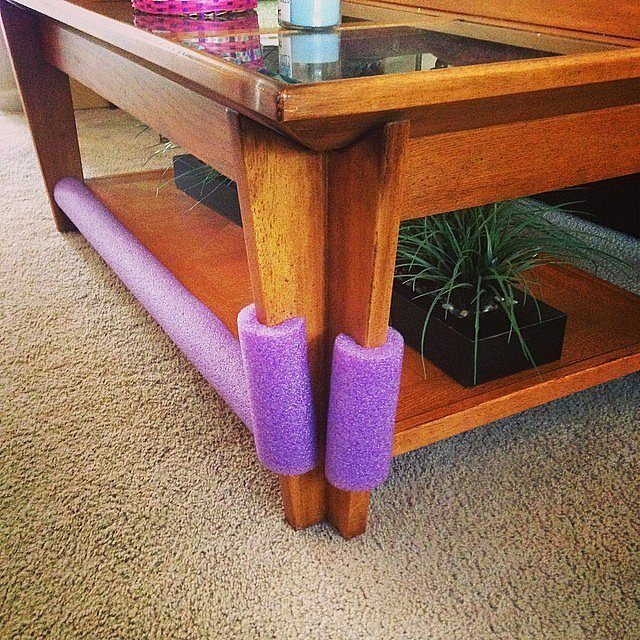 The material they are made out of, polyethylene foam, is actually incredibly versatile and can be used to sold so many different problems around the home. They can actually be used for a variety of DIY projects around the house. 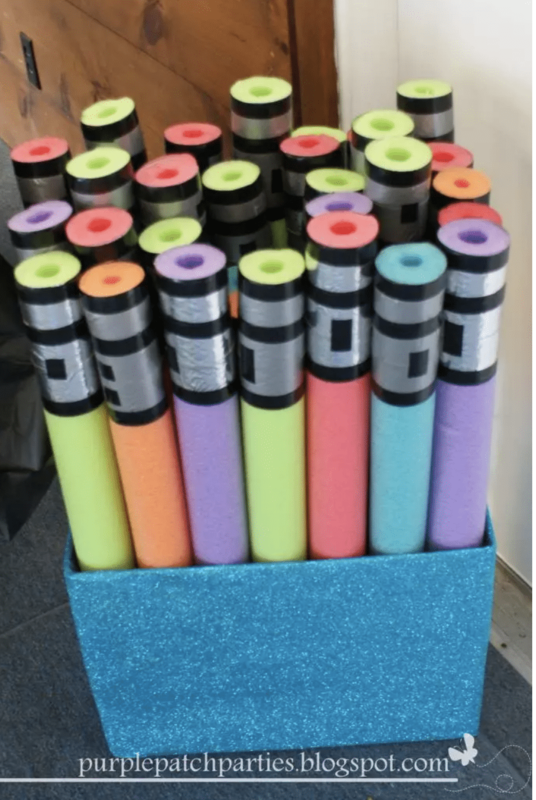 Here are a few fun and clever ways to use pool noodles in an effective manner. 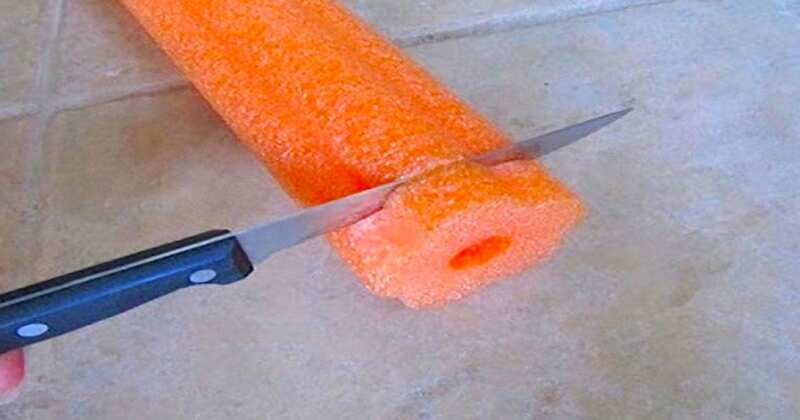 Do you know any other brilliant ways to use pool noodles at home? If so, let us know in the comments below! While you’re out enjoying a hot, summer day in the pool, why not treat yourself to some chilled refreshments? 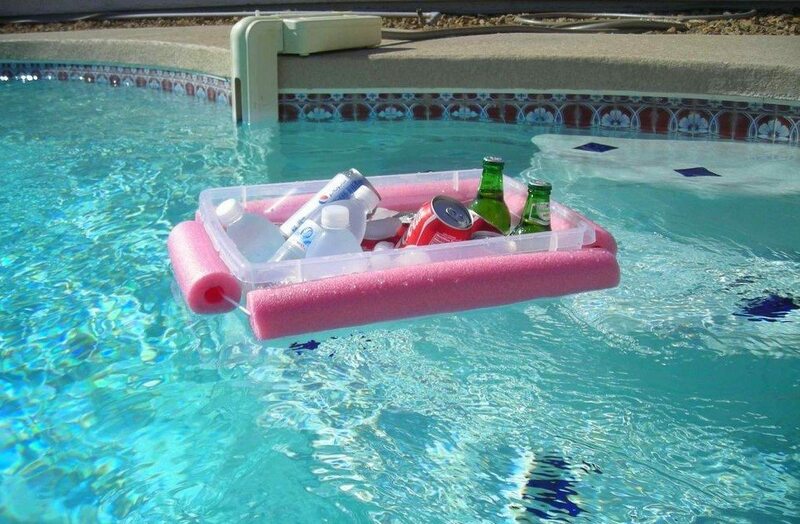 Build this floating ice chest using pool noodles, and you can always an ice cold beverage by your side. Use your pool noodle as an extra long funnel. Hook it up to your sink, and control the flow of water! It makes housework so much easier. In the winter, your house might feel cooler and chillier than usual because the cold weather outside is finding its way through the door because the weather stripping isn’t right. To prevent this, use a pool noodle to fill the gap between the door and the floor. If you have a narrow garage, then parking your car inside can sometimes be a pain. It might be difficult to get out of your car, because you’re afraid of banging your car door against the wall. To protect your doors from scratches and the wall, build this padded garage bumper. Learn more details here. 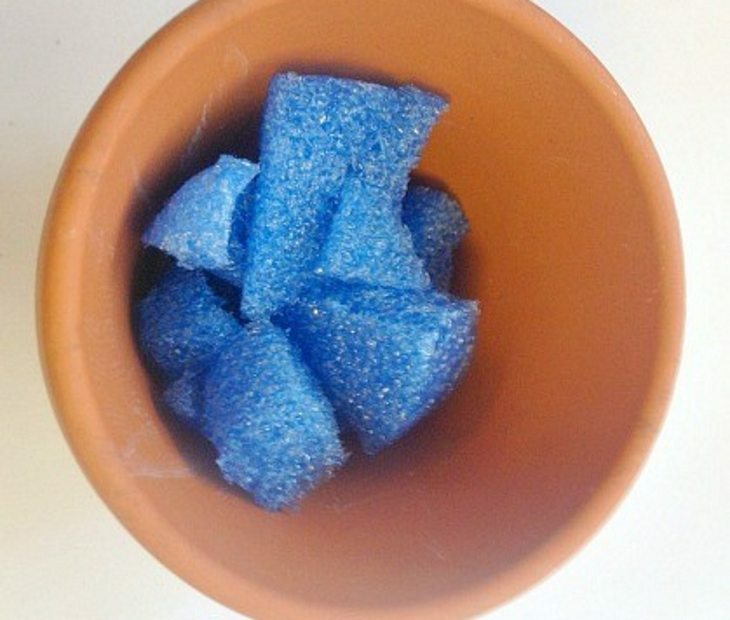 Use a pool noodle as a support for plants in place of a wooden stake. Cut the noodle lengthwise using a knife. Then, fit it around the base of a plant. As the plant gradually grows taller, you can add another section to support the added growth. 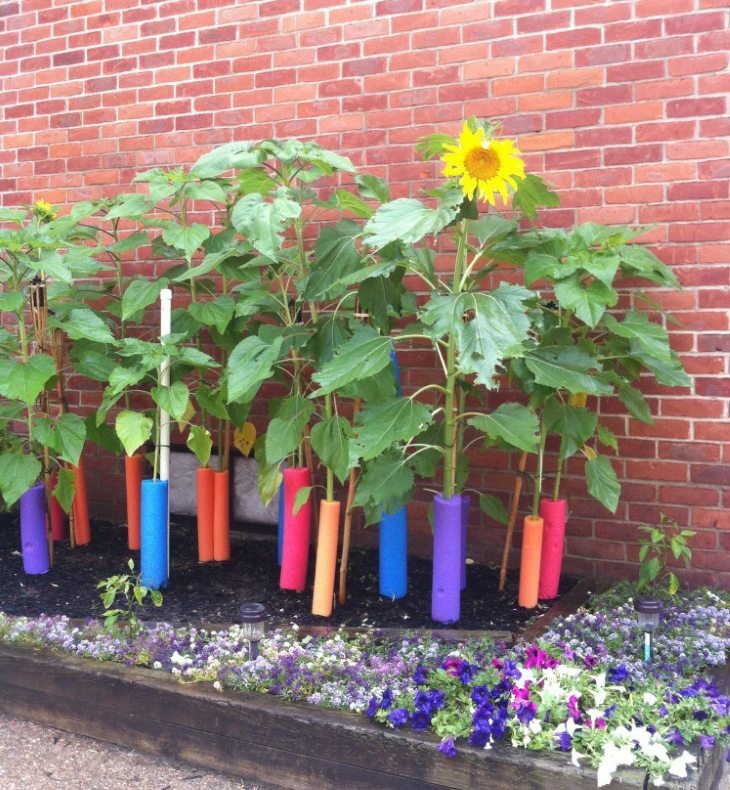 Use an assortment of pool noodle colors for a vibrant-looking garden! 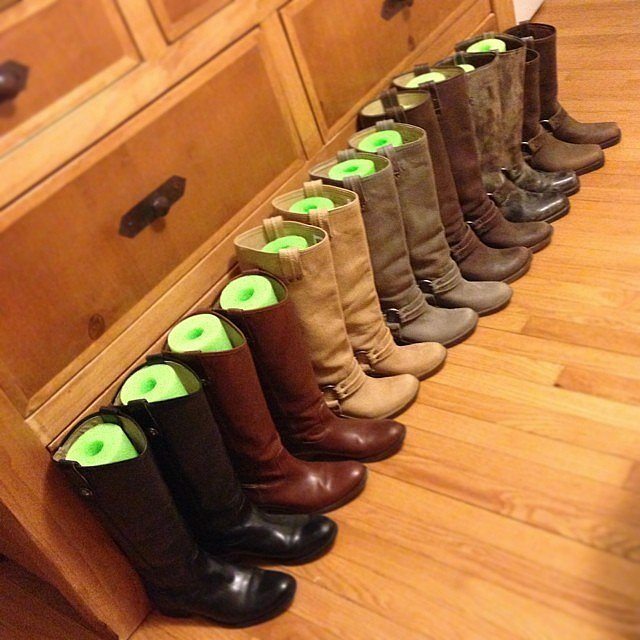 Stuff your boots with pool noodles to help maintain their shape when you are not wearing them. Cut the noodles to the height of each boot and place them inside. It’s that simple! Fit a pool noodle around a hanger to create a soft curve. 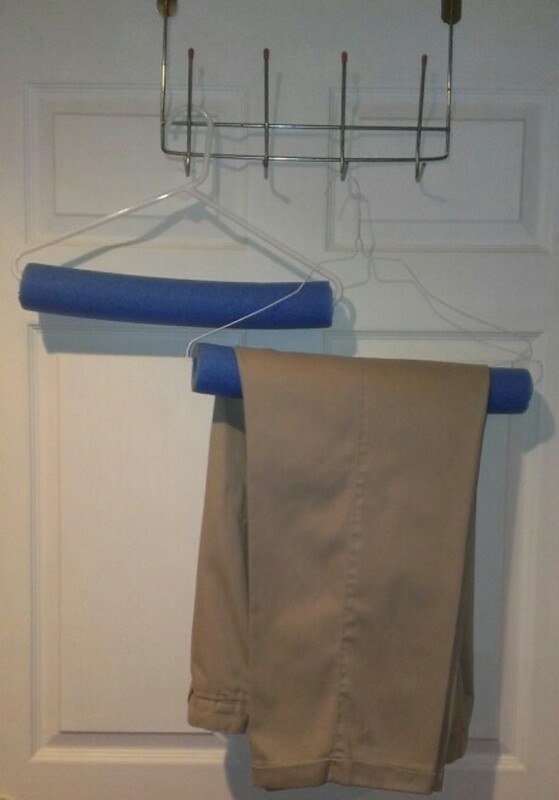 Then, hang your pants around the pool noodle to hang dry without having any creases in your pants. If you find yourself chasing napkins in the wind, then try this nifty trick out. Cut noodles into rings. Then, use the ring as a napkin holder. You’ll never have to chase after paper napkins in the backyard or park again. 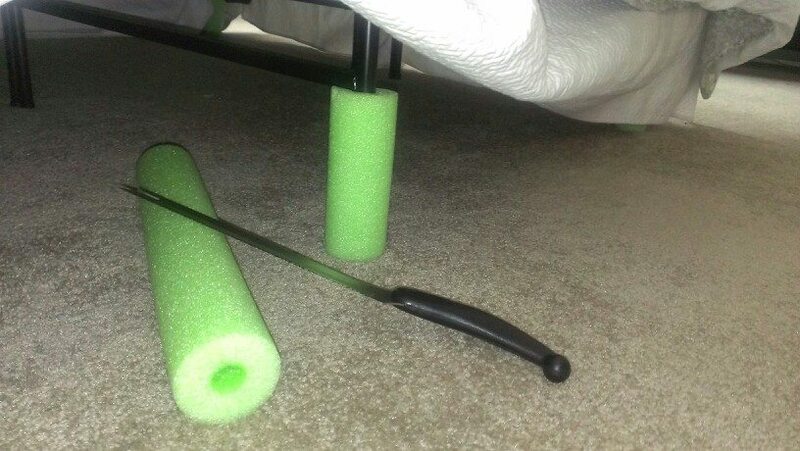 If you are constantly stubbing your toe on your bed frame, then try this simple solution. 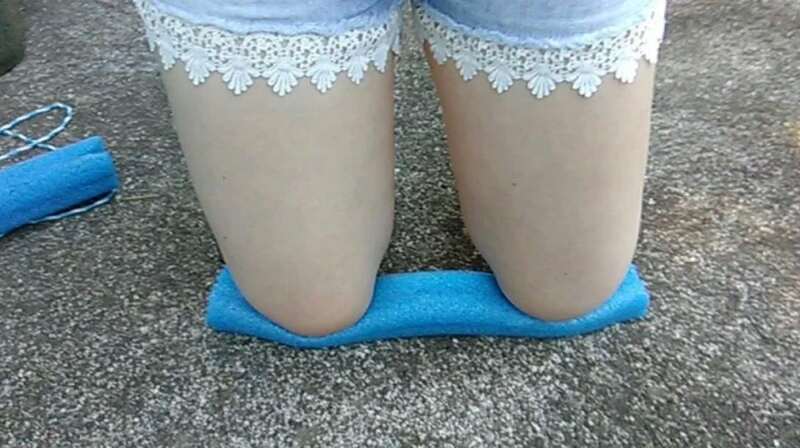 Cut a pool noodle and wrap it around each leg of your bed frame. Now, if you ever walk into the bed frame, it won’t hurt nearly as much! 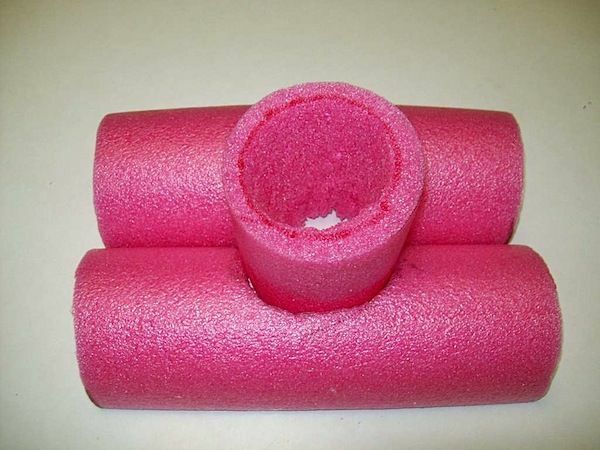 For all the various DIY projects you use your pool noodles for, be sure to keep the remnants. These can actually be used as pot fillers! They provide drainage and they save you money since you’ll need less soil at the bottom of the pot. Does your kid constantly kick the back of your seat? Use a rope to attach a pool noodle to the bottom of their car seat so they have a place to put their feet other than the back of your seat. 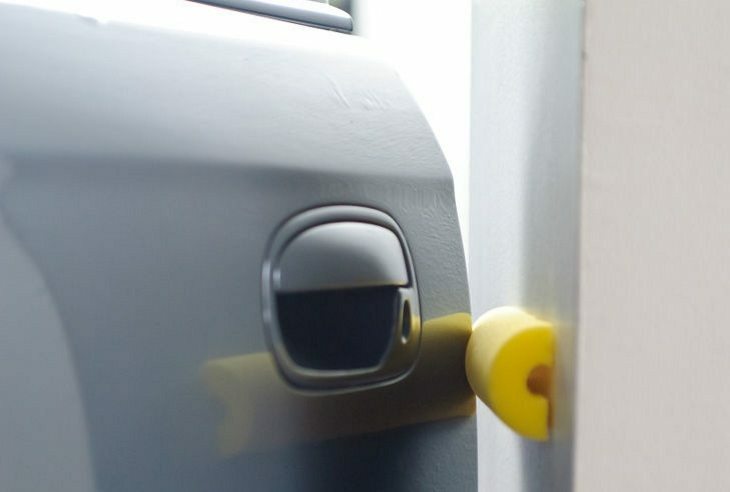 Put an end to slamming doors with this doorstop. Learn how to craft one here. 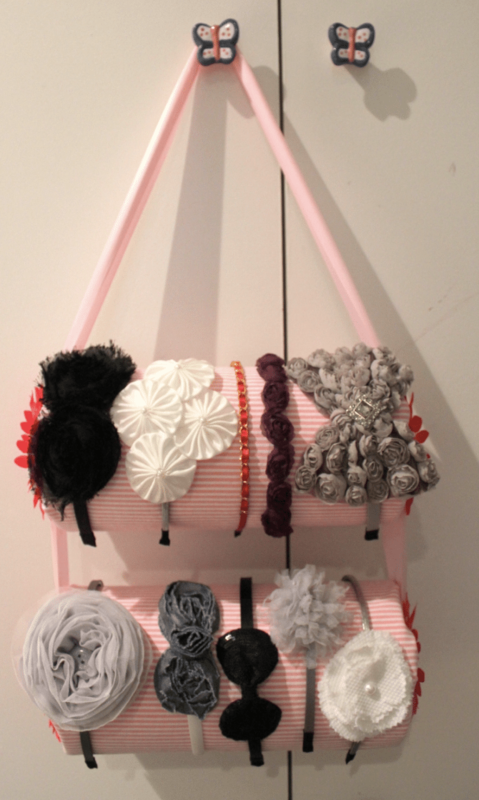 Cover some pool noodles with fabric and ribbon to create a place to organize your headbands. You can find a tutorial here. 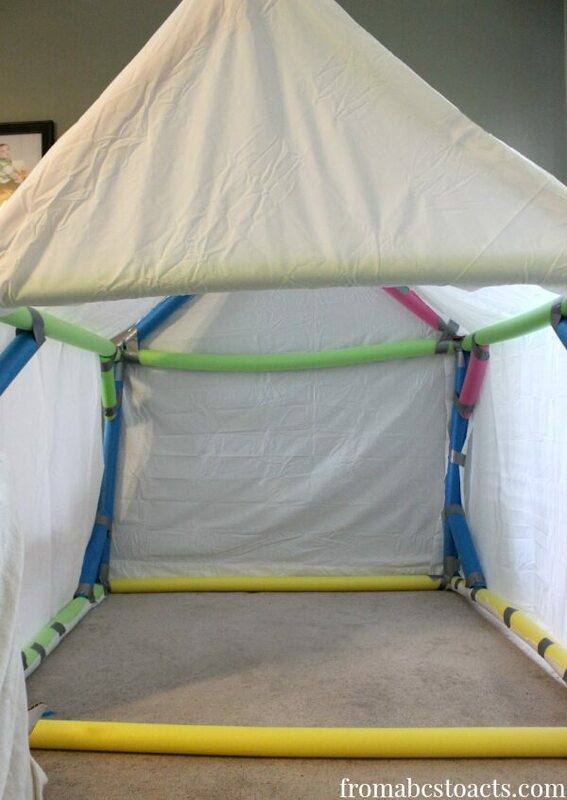 Make a soft foam playhouse with some pool noodles with the instructions you find here. Enjoy a mid-swim beverage with this floating cup holder made from pool noodle pieces. 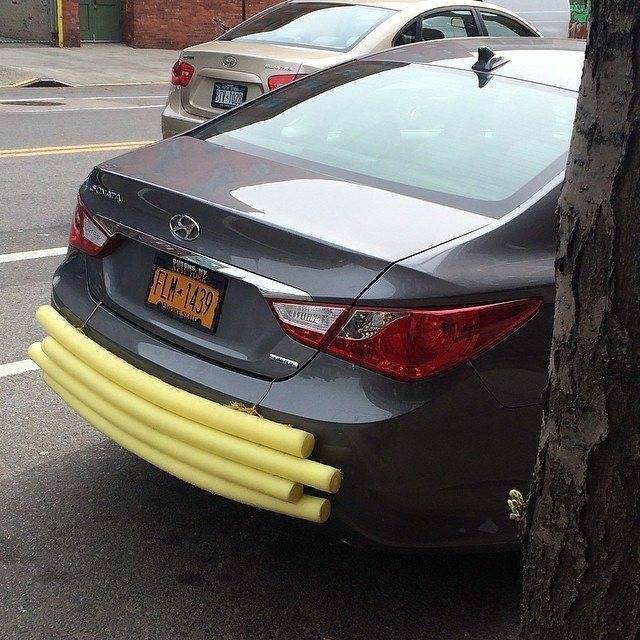 Protect your car when it’s parked by making a bumper from pool noodles. Just pop it back in the trunk when you’re ready to go. 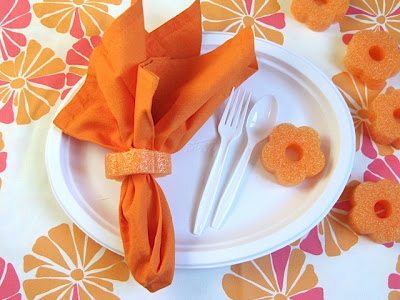 Wrap spare fabric around pool noodles and secure with a pin or ribbon to keep it wrinkle-free. 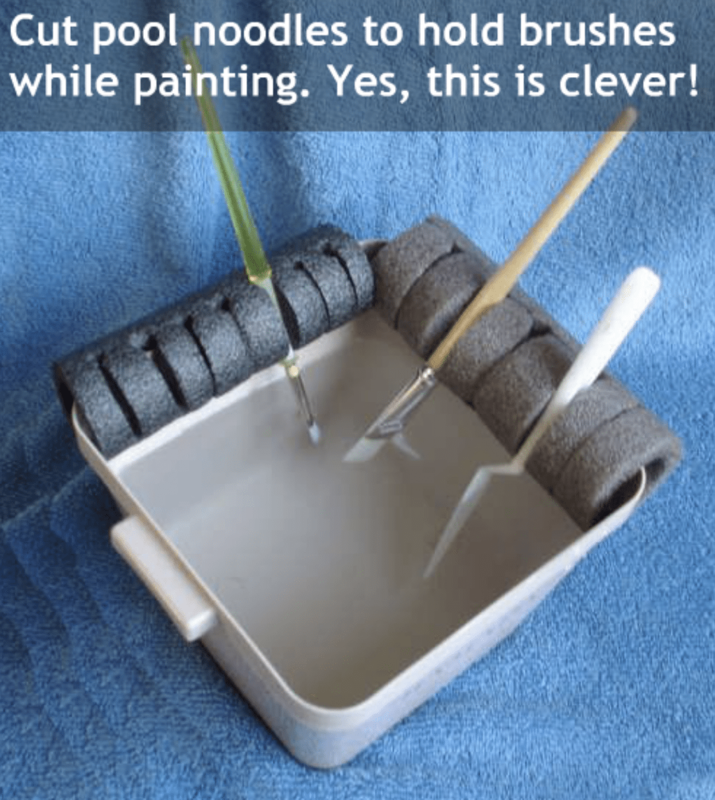 Cut slices into a pool noodle to hold paintbrushes and tools on the side of your bucket. 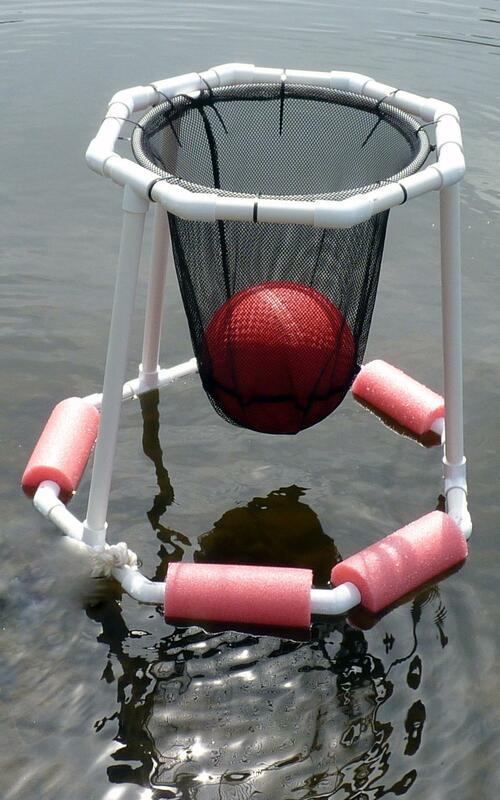 Build a floating basketball hoop for the backyard pool. There’s nothing more fun than a game of basketball in the water! 20. Rolling Off The Bed? If your children are learning to sleep on a bed and not a crib for the first time, there’s a chance they may roll off the bed. 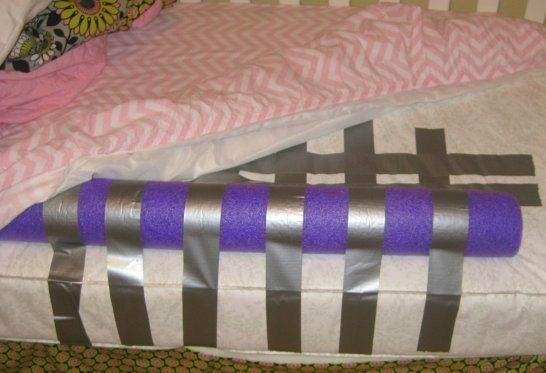 Protect your toddlers by creating a bed rail with a pool noodle. This acts as a bumper! 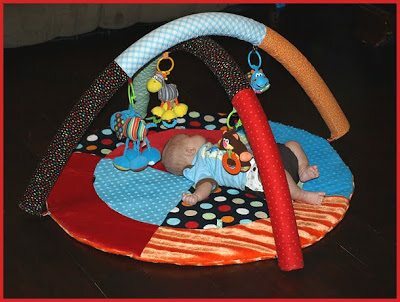 Create a small play mat for your little one using just a few pool noodles. This could provide endless entertainment for even the most tireless baby. Find the full tutorial here. Instead of letting your child’s feet dangle off the car seat, create them a footrest using pool noodles. Cut a pool noodle to be the same width as the car seat. 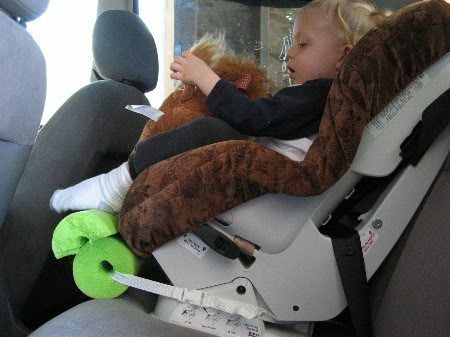 Then, run a strap through the pool noodle hole and attach it to both sides of the car seat. 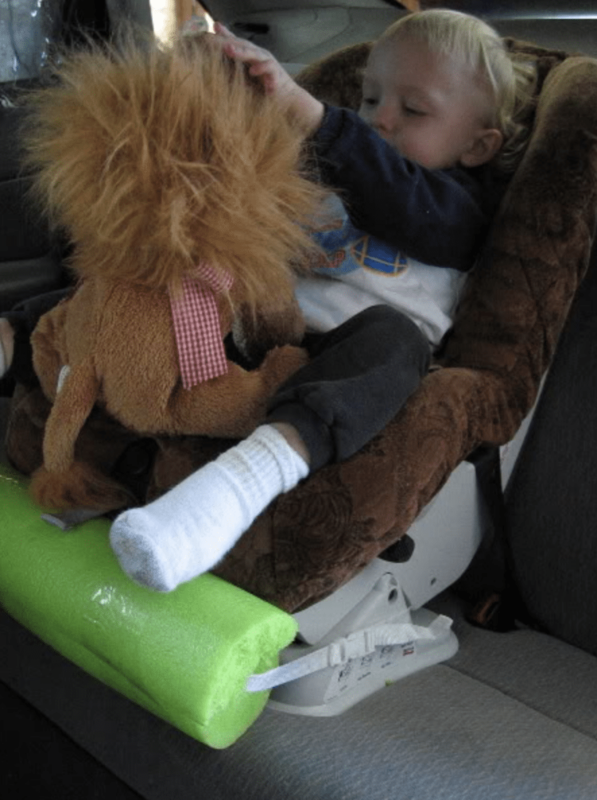 You like foot rests on long rides, so why wouldn’t your children? Tape two ends of a pool noodle together to create a circle. 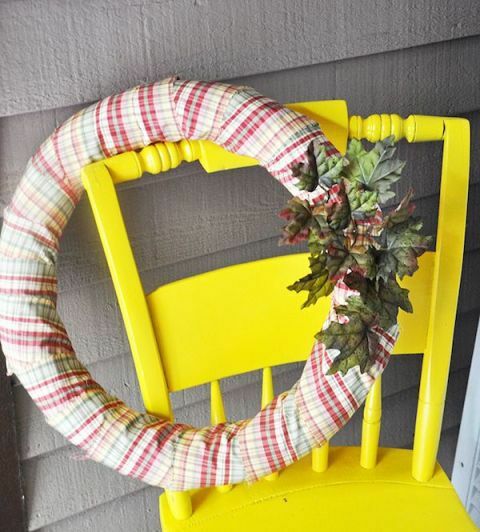 Then decorate the pool noodle with anything that’s festive or holiday-related to create a lovely wreath for the home. 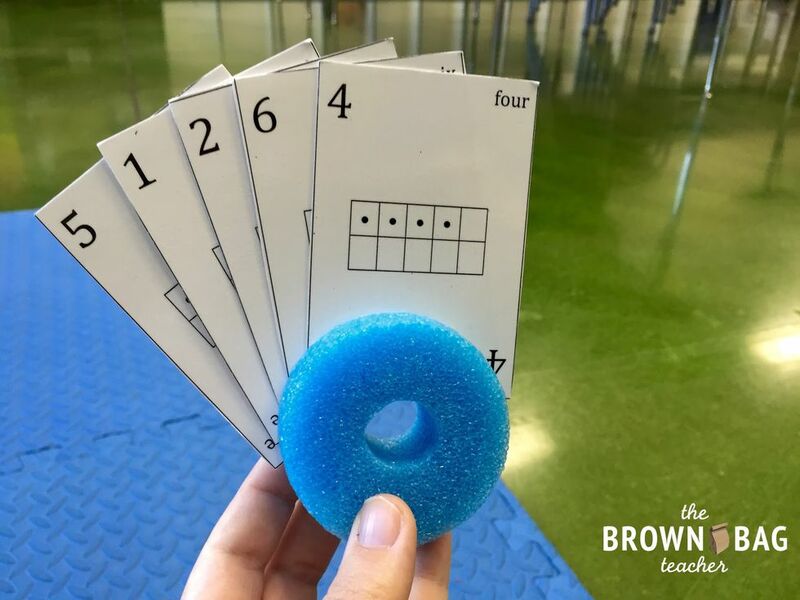 Cut a pool noddle to use as a savvy organizer for flash cards and other cards. This can also be used for playing cards when you’re playing with your kids. 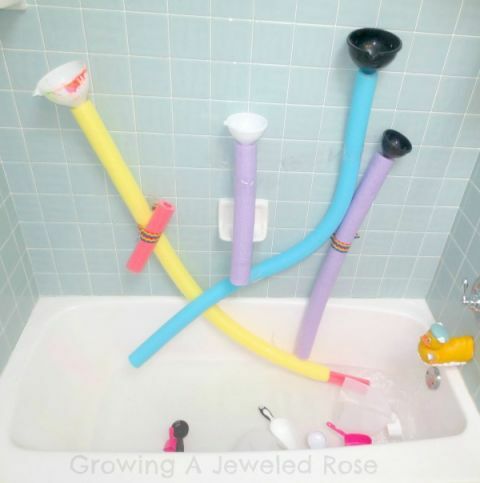 Use pool noodles to create a bathtub playground for your kids to play with while you give them a much-needed bath. Pool noodles can make the entire experience more enjoyable, and pretty soon, your kids will be begging to stay in the bath longer! 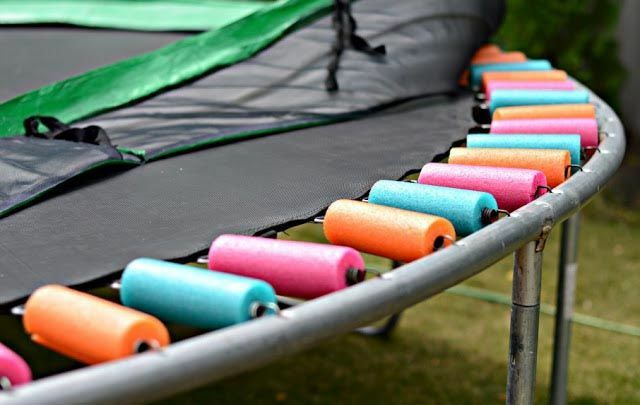 Cover springs on a trampoline to keep them safe for your kids with pool noodles! 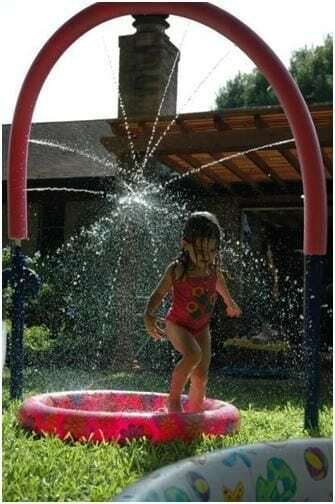 Punch holes in a pool noodle and run a hose through it to create a nifty sprinkler machine that your kids will love in the summertime! Use pool noodles to create an awesome bodyboard for the pool. 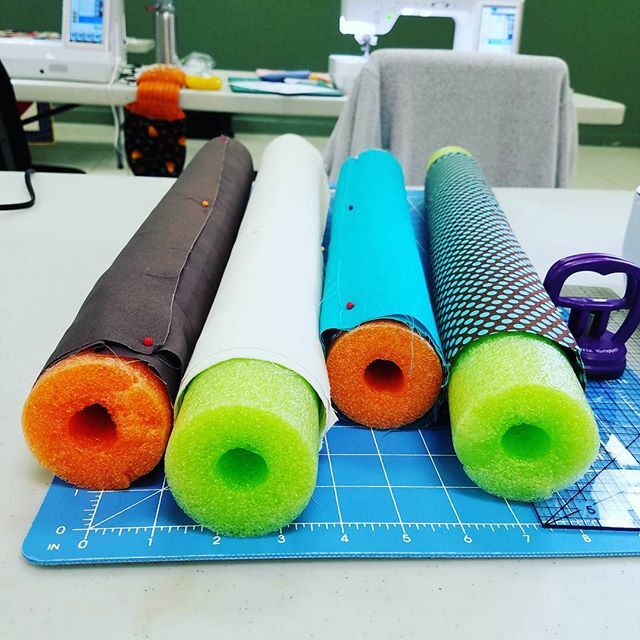 Use a pool noodle to store/travel with fabric. 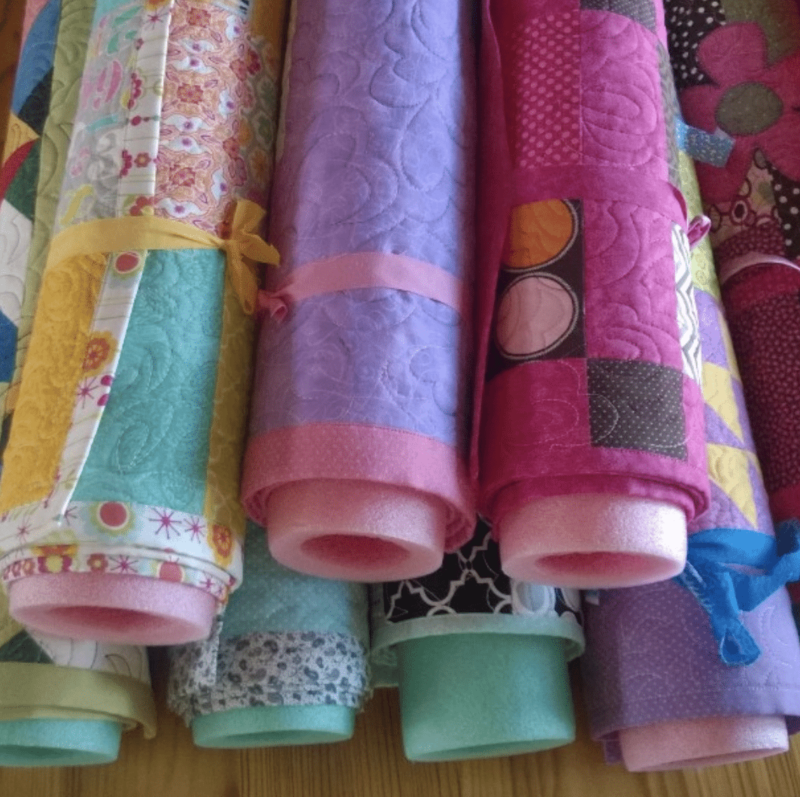 It’s a great way to prevent fabric from wrinkling. 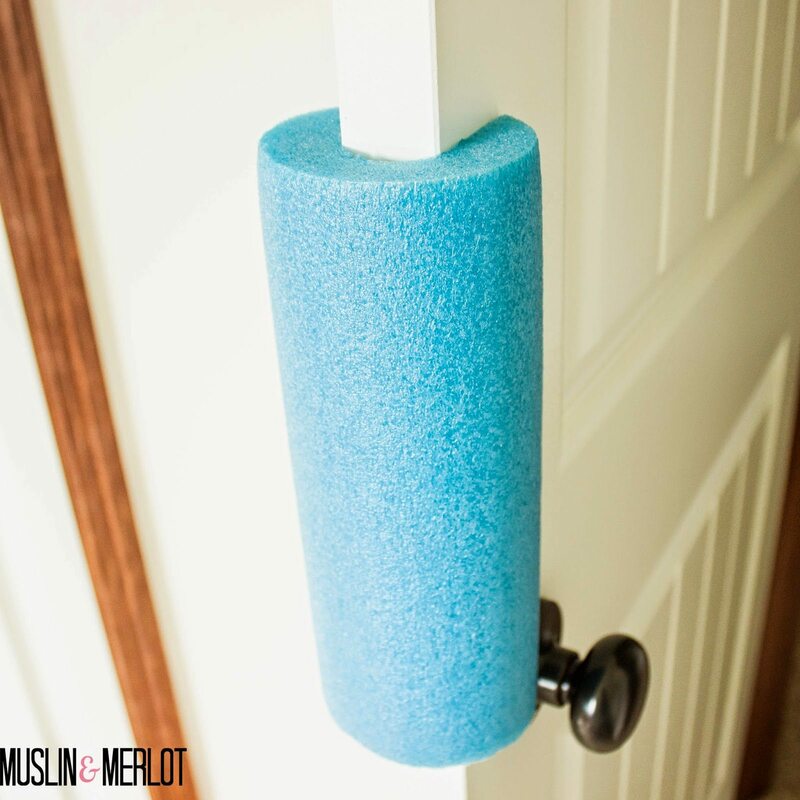 Use pool noodles as an affordable and efficient way to child-proof your home. You can even use different colored pool noodles to better distinguish what’s safe and what’s not to your kids. 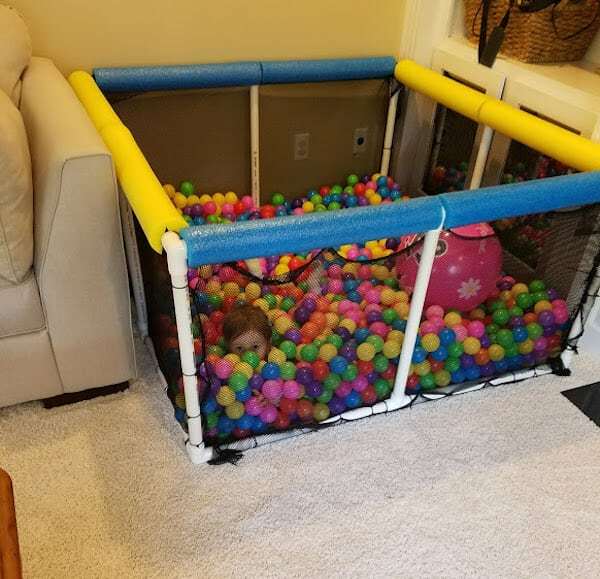 You can have hours of fun in this DIY ball pit. All you need is some PVC pipe and pool noodles. Learn how to make one here. Why buy expensive toys your kid won’t be playing with after a month? You can make a fun lightsaber with a pool noodle. 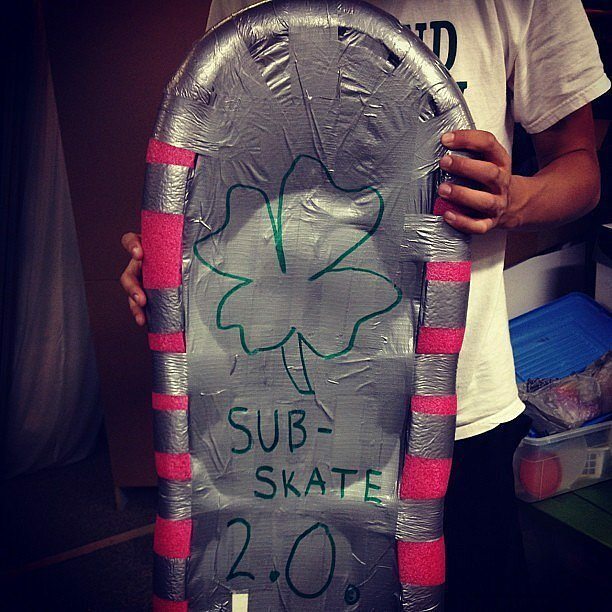 All you need is some duct tape. These are perfect if you’re throwing a Star Wars themed birthday party. 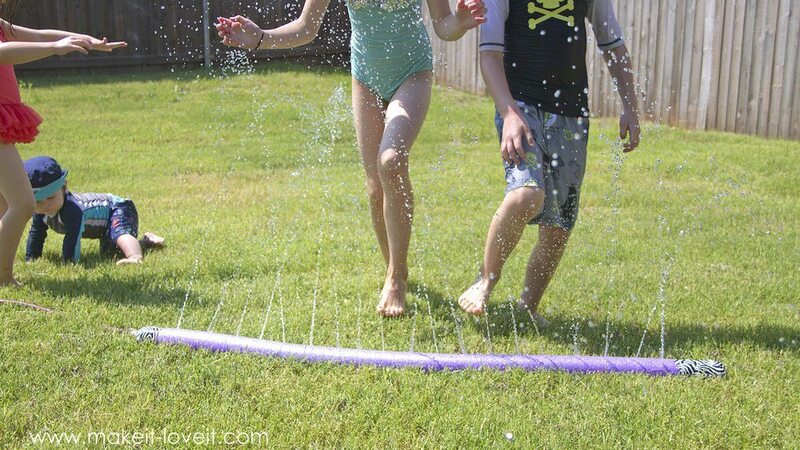 You can create a whole summer time obstacle course in your backyard with some pool noodles. This project uses some PVC pipe and pool noodles. Get the details on how to make it here. Use a pool noodle to create a beautiful display for your cake pops. Use some tape to secure it into a ring and decorate your ring. 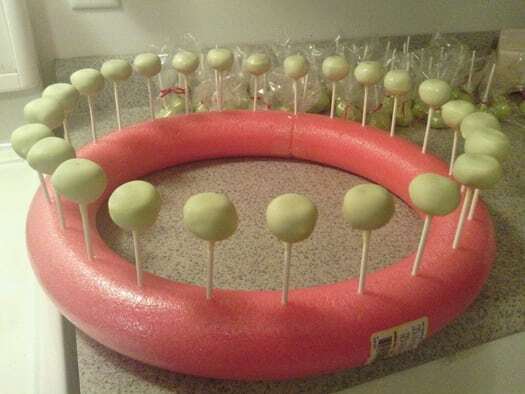 Make holes in the ring to place your cake pops in. Have fun races with your pieces of pool noodles. 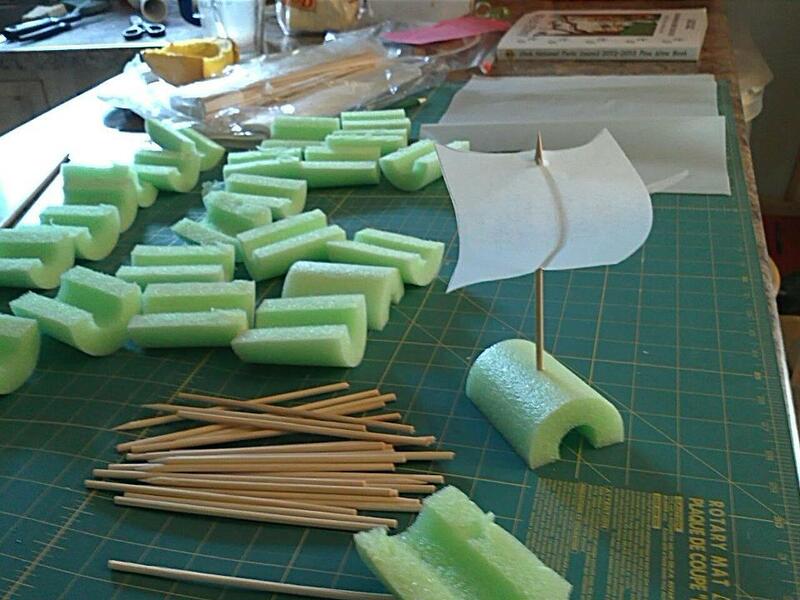 Just cut them in halves and pieces and use a piece of paper and a wooden skewer to make a sail. Learn how to make them here. Don’t hurt your knees when doing garden and outdoor work. Just a pool noodle in half. Place it under your knees to cushion yourself. 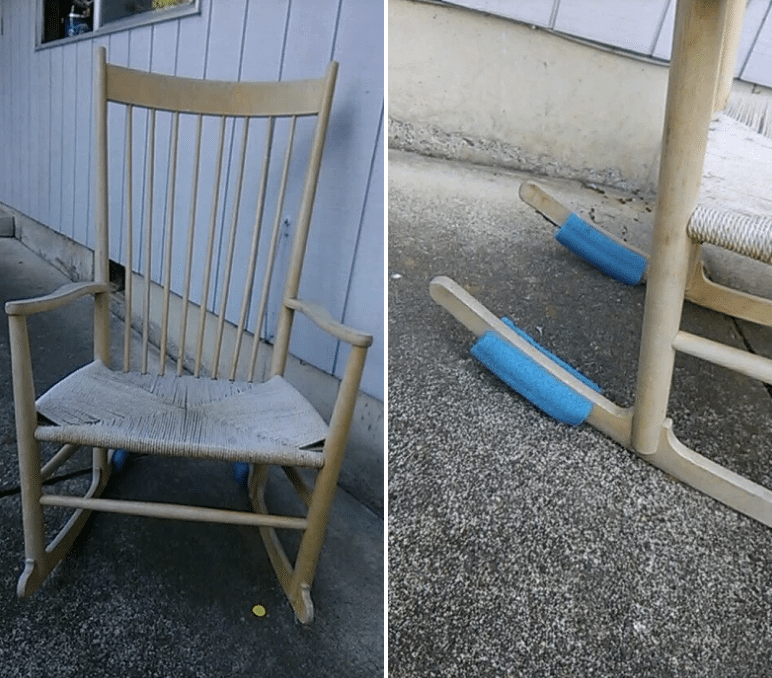 Use pool noodles to keep a rocking chair stationary. Cut an 8-inch piece of pool noodle and slit it open. Place the noodle through the back of the legs of a rocking chair. If your chair back is rubbing up against your wall it can create holes. You can prevent this by using pool noodles. Just place a piece on areas that touch the wall.